I don’t get asked on many press trips and often miss the ones that come my way because I am on the road for my own little endeavours. However, when I got a mail from one of the people foolish enough to pay me for my musings asking if I would represent them on a trip to the Bushmills distillery in Northern Ireland, I jumped at the chance. The Six Counties (go on, see if you can name them. 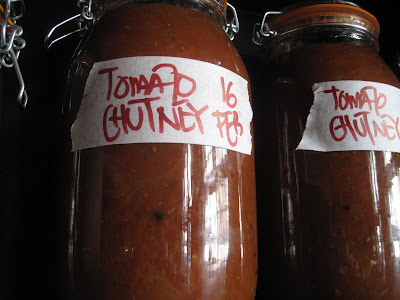 It’s a bit like naming all Seven Dwarves. There’s always one that gets away) was one of my favourite stops on last year's EATING FOR BRITAIN tour of the U.K and any opportunity to head back again was one I was never going to turn down. Our tour was made even more interesting because our guide was Master Distiller, Colum Egan, who showed us some parts of the distillery, which are not normally open to the public and then led us through a tasting of the range. It wasn’t all to my taste, but I did come away promising to buy myself a bottle of Bushmills Black, their premium blended whiskey which was far more within my price range than my other favourite, the 21 year old matured in Oloroso barrels. After the tour, the handful of other journalists on the tour persuaded me to join them for a few pints of Guinness at The Harbour bar in the nearby town of Portrush. In a “you couldn’t make it up” scenario, the locals decided to have a bit of a sing song on our arrival, leading to the unlikely sight of three florid faced pensioners being joined by a group of American visitors in impromptu renditions of traditional Irish folk songs and a slightly squawking version of Mr Cash's “Ring of Fire”. The Man in Black is still whizzing around in his eternal resting place as I type. Inevitably the next morning, most of my companions were a little bit jaded and I decided to perk them up with a proper “Ulster Fry”. On my journey last year, I was lucky enough to meet Peter McKonkey of The Georgian House in Comber, just outside Belfast. His was the finest breakfast I found in the whole of the UK (go and try it and tell me that I am wrong) with superb ingredients sourced from all over Ireland. He did not let us down and by a little before midday, the group was pushing back their chairs, rubbing their bellies and declaring that they would probably never eat again. They were lying. After our breakfast, we spent the next night enjoying ourselves in Belfast’s pubs, clubs and the bar of the cocktail bar of The Merchant Hotel (one of the very best in the world) Although I hit the hay pretty early on, some of my younger companions partied quite hard and, the next day, were in need of even more restorative stodge. As luck would have it, around the corner from our hotel was one of Belfast’s most famous chippies, John Long. It’s an odd looking place, the windows of the building covered in protective grating and the door clad in a steel coating. 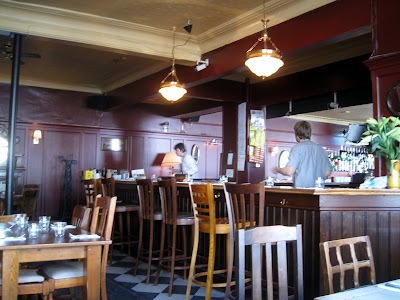 It was empty when we arrived, but soon began to fill up with locals enjoying the enormous portions of cod & chips. It wasn’t the best fish & chips my friends could have tried for their first experience of the genre. The batter could have bubbled up a bit more and the chips needed to be a little less soggy. But, they were not bad, all cooked as they should be in beef dripping and, with the addition of some “bread and spread” I was also able to guide my new friends through the rudiments of fashioning the perfect chip butty. Fortified once more, the rest of them went off to watch the rugby at a local bar, downing even more Guinness I am sure. I, well I went back to the hotel and back to bed for a few hours. You see there is another very valid reason I don’t go on too many press trips. I am just too bloody old to keep up. Bruno Loubet may well have been away from the capital for the best part of the last decade, but it is not like all he was doing was laying on a beach while he was in Brisbane. It was obvious from last night’s meals that he has returned to London with all his considerable skills in the kitchen very much intact. Hermano Primero and I have quite a history with Bruno Loubet. 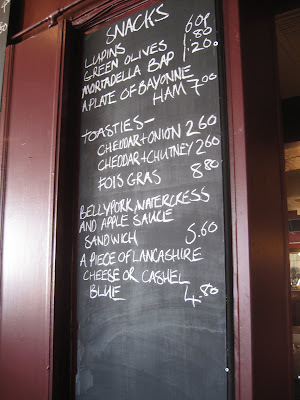 L’Hippocampe (where Arbutus now stands) was the first place where HP ever dropped £100 on a meal in the early 1990’s. L’Odeon, one of the great gastrodomes that were all the rage fifteen years ago, was one of the first places I did the same. 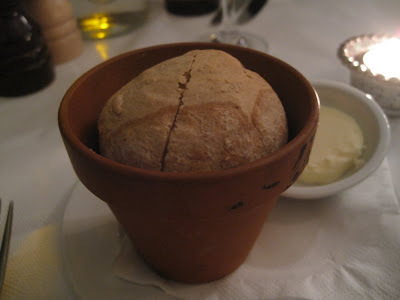 We both liked his brief foray into Moroccan food at Bruno Soho and his presence in the kitchens during the opening weeks of Isola’s existence even persuaded us to visit a gaff run by Oliver Peyton, our least favourite restauranteur in London. When I found out, later on that he had opened up a series of restaurants down under in Brisbane to great acclaim, I assumed that he had decided to leave the capricious world of London dining behind for good. So, it was a surprise when rumours of his return began to appear on Twitter and even more of a surprise when they turned out to be true. The Zetter Hotel, home of the former football pools company, may seem like an unlikely venue for a star chef to make his return, but they have done a great job with the room. I found HP already examining the menu at a table to the rear of the restaurant when I arrived and one glimpse reassured me that any fears of Loubet bringing back packets of galangal and lemongrass with him from Australia were unfounded. The menu is supposed to present a modern, lighter take on Loubet’s bistro cooking, but appeared pretty much as we remembered and once the waiter announced that there was a starter of Scallops with Black Pudding (one of his signature dishes back in the 1990’s) the whole evening felt like putting on the most comfortable pair of slippers. Our first tastes of our starters reminded us why we had always been such big fans. 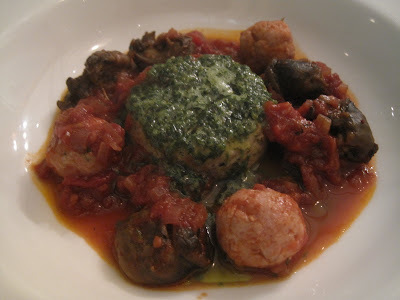 HP’s “Mauricette Snails and meatballs with royal de champignons” was Bruno’s cheffy take on a favourite dish of his mothers. Everything about it was, to use a word that HP repeated throughout the evening “textbook” with meaty snails, delicate veal meatballs and a tomato sauce that exuded sweetness. 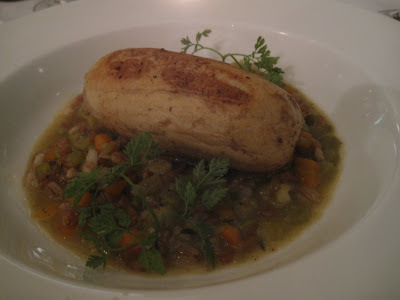 My own guinea fowl boudin blanc was even better, perhaps showing the new approach, with a feather light sausage of an almost mousse like texture sitting in a light broth studded with carrots, ham and barley flavoured with the addition of chervil. 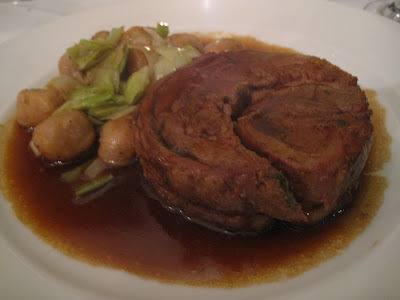 I could easily have ordered every main course dish, but chose the veal dish of the day, which was a piece of rolled breast, served with gnocchi and leeks. 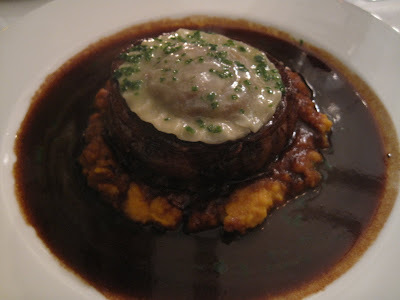 HP went for the already much lauded dish of Hare Royale with onion raviolo and a puree of pumpkin and dried mandarin. Both dishes showed a richness that might well be considered unfashionable today, but although both were unapologetically full on, they were pitch perfect with no sign of the fierce reduction that seems to be the blight on so many meat dishes in high end places. The hare shredded perfectly to release its gamey steam, while the veal broke apart with just a touch of the knife. 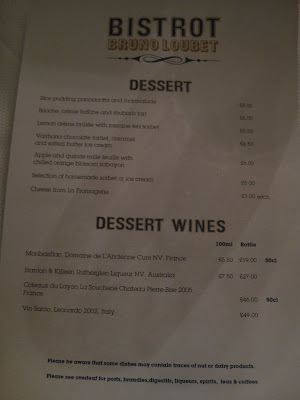 Neither of us could recall what desserts were like at Loubet’s previous restaurants, which probably says more about our ambivalence than their quality. 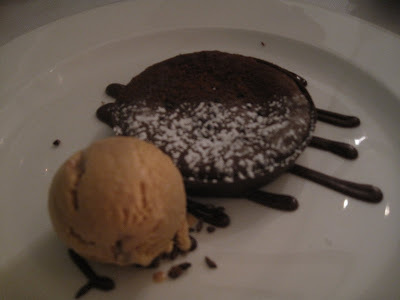 Here, almost inevitably, HP went for a selection of ice cream while I chose a chocolate tartlet with caramel and salted butter ice cream. 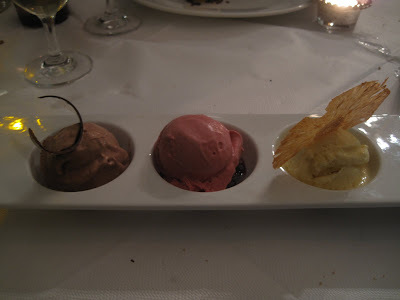 The ice creams were disappointing with only a small scoop of morello cherry flavoured deemed worthy of him finishing. But, the tart was spot on, the casing cracking under the pressure of my spoon and the inside served slightly warm so the chocolate oozed out onto the plate. With some coffee and fresh mint tea, it made a lovely end to a lovely meal and one that with a bottle of something punchy from the Laungedoc came to £117 including service. That seemed like a fair amount for three courses of excellent cooking by one of our all time favourite chefs, particularly when put in context of some of the more dispiriting experiences we have had recently. 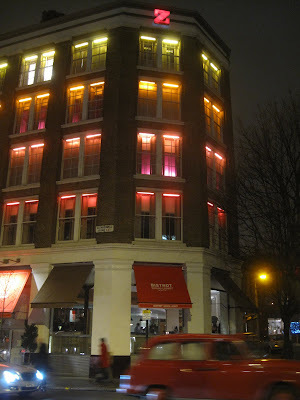 It would be easy to go overboard with Loubet’s return to London particularly as he is obviously still cooking with considerable enthusiasm and producing dishes of the highest level. There should be more places in London like this, but then again there should be more chefs in London like Bruno Loubet. A very welcome return indeed. If you’ve eaten out regularly in London during the past twenty years then it’s very likely you will have had food prepared by a group of female chefs who have not had nearly enough of the recognition they deserve. Like The Wrecking Crew – those session musicians who in the Sixties played on just about every hit going – these chefs have quietly got on with the business of cooking and turning out the sort of food that you’d want to eat every day. People like Carol Cradock who cooked at Bibendum and Vinoteca, Rosie Sykes who was at Alastair Little and ran her own restaurant – the much missed Sutton Arms in Smithfield. Another of this band was Trish Hilferty who cooked at the Eagle, the first gastropub and who also ran her own place, The Fox in Shoreditch where I used to go several times a week for my supper. That was several years ago and apart from writing some books I didn’t know where her career had taken her. That was until I pitched up at the Canton Arms in Stockwell on Saturday, where she’s opening up this new Ale and Food House - I think it’s preferred description - with staff she worked with at the Anchor and Hope and Great Queen Street (I’m sure you’ve all heard of those gaffs). 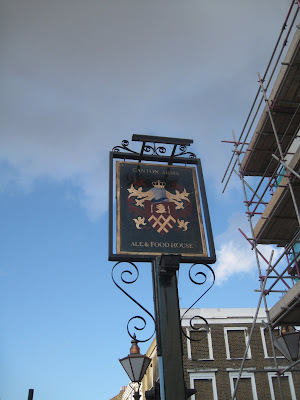 The setup at the Canton Arms will be familiar to anybody who’s visited the A&H or the Magdalen Arms in Oxford. There’s a pub bit and there’s a restaurant bit although you could probably eat what you want where you want – it’s that sort of place. Apparently, the aim is to not alienate the locals with any of the sort of fancy-schmancy nonsense you’d get North of the river. This playing it quietly for now extends to the menu which is pretty short and supplemented by a few bars snacks with (hallelujah) no Scotch Eggs to be had (the backlash begins here). 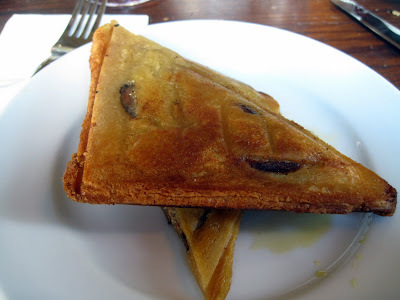 Speaking of bar snacks, irrespective of what I was going to choose for the rest of my meal there was no way I wasn’t going to order some Foie Gras Toasties. I’ve no idea if they’re an original idea - although I’ve never seen them on a menu – but they’re certainly a brilliant way of using that Breville toaster gathering dust in the cupboard. I haven’t had a toastie since, oh, 1982 but I’m sure they never tasted like this. Rich, but in the nicest possible way they’re best eaten when the liver within has had a chance to go a bit runny. By accident I spilt some red wine onto my plate and some soaked into one of the golden-hued triangles. If anything it tasted even better. I’m putting this up there with the discovery of Fire and the Wheel…and it’s all mine. 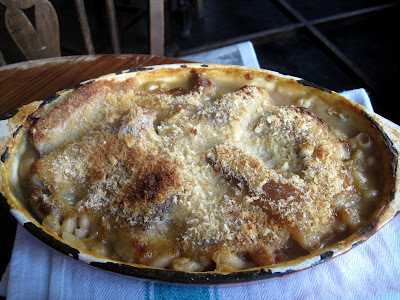 A Cassoulet for two was the stuff of dreams - for Trenchermen (and women) and Hermanos, natch. 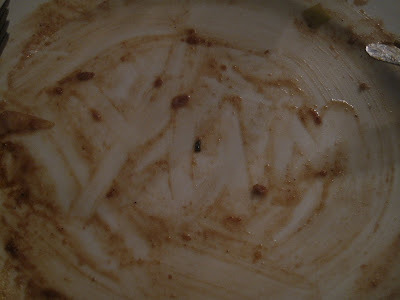 The beans had been cooked so they retained a little bite and hadn’t disintegrated into mush. 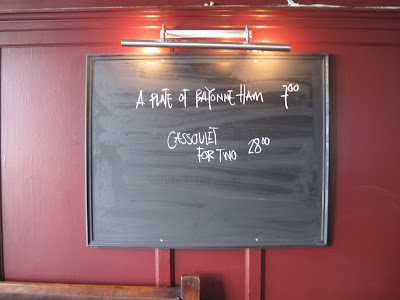 There were hunks of good Belly Pork topped with strips of crisp crackling and legs of good-flavoured Duck Confit. A layer of breadcrumbs added extra crunch. Only some fat sausages underwhelmed a little and got lost in the mix. 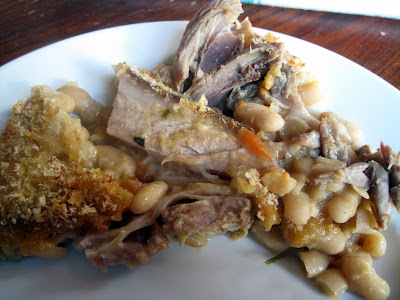 There was some moisture too so that the dish made for easy eating although next time I’ll take up on the offer of a green salad on the side, a Cassoulet really cries out for something sharp and vinegar based.. 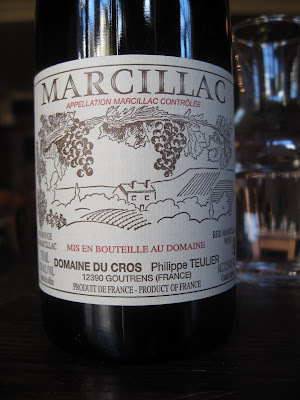 I made do with a dab of Dijon mustard, some of homemade Chutney and a glass of Marcillac. 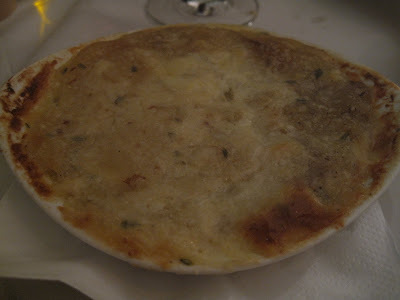 Unlike many Cassoulets this one wasn’t overrich so a pud wasn’t out of the question. 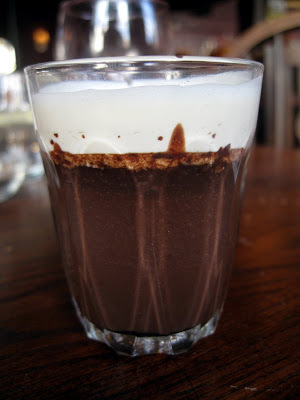 A little Chocolate Pot hit the spot, as it so often does, and a glass of a nascent Damson Gin made for a pleasant digestif although it didn’t prevent me waddling towards Stockwell Tube in the manner of the quack-quacks I had just eaten. Bread from Di Lieto bakery is very good and apart from a bit of over-enthusiastic pouring, service was relaxed and professional, a A&H trademark. 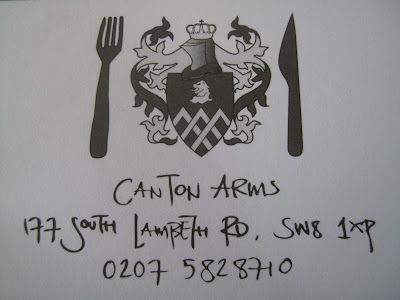 I think the location should mean the Canton Arms will be frequented mainly by locals and not chinless yuppy hordes from Fulham (I don’t think they’d be able to navigate their way to Stockwell anyway) which I believe is the hope of the owners. So if you’re in the area pop in have a pint and a toastie or better still a plate of Trish Hilferty’s food and enjoy yourselves. Just don’t expect to find a fully formed Anchor and Hope Mark 2. Yet. 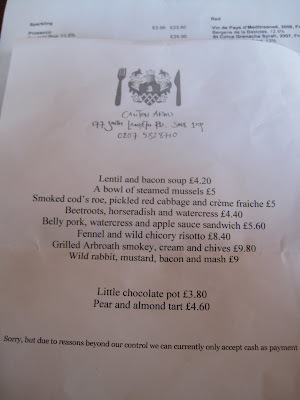 PS When I visited the Canton Arms had been open for three days. You see, new restaurants can get it right. It really isn’t that hard. 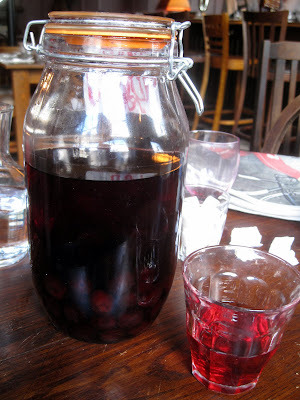 All they have to do is give a damn and, it was apparent from the moment we walked through the doors of Caravan, a new restaurant/café on Exmouth Market, that the four owners, the chef and the staff really did give a damn. It makes all the difference. This was only the restaurant’s second day of trading and HP had marked it as a potential venue for a late morning meal after my own day’s activities had been changed at short notice. Despite their newly opened status, Caravan seems to have hit the ground running. The welcome was immediate and charming and the service prompt, already in full swing as the room filled up with hungry punters. My only complaint about an other wise lovely room is that the rickety wooden chairs are the most uncomfortable I have encountered in a restaurant in London in, well just about ever. That may also be, however because my ample rear provided more of a challenge than they anticipated from the skinny jeans brigade who made up most of the other custom. The chef at Caravan is Miles Kirby, formerly Head Chef of The Providores in Marylebone. I am not always a fan of Peter Gordon’s “Hey lemongrass is on special, let’s use it on everything” approach, but they could always be relied on for a decent weekend brunch and Kirby has obviously brought that talent with him to Caravan. The cafe will be specialising in coffee roasting and also has a tasting room planned for the basement, which makes the fact that HP’s coffee was served cold a little strange and annoying. He comforted himself with a bottle of Shepherd Neame Whitstable Ale, which was served at the perfect temperature, while I had stuck to a pot of loose leaf English Breakfast tea and an orange juice. Prices appear reasonable at first, with my “Caravan Fry Up” coming in at £8 and HP’s Salt Beef Fritters at £9, but costs can soon mount up when you add side dishes, as we did in the form of Bubble & Squeak and “Smokey” Black Pudding. It was obvious, however, as soon as our plates were deposited in front of us, that the prices reflect the use of superb ingredients and the hiring of a top-notch chef. The fry up comprised a thick slice of sourdough toast topped with meaty mushrooms, slow roasted tomatoes, thin and deliciously crisp bacon and two perfectly fried eggs, which despite being flipped as requested, still retained a soft runny centre. Perfect short order cooking and only the inexplicable absence of a good sausage on the menu stops me from calling this one of the best breakfasts I have eaten in donkeys years. HP was less happy with his choice. The egg, again, was cooked perfectly and the green beans that sat on top of the salt beef fritters were crunchy and not over powered by a mustard dressing. 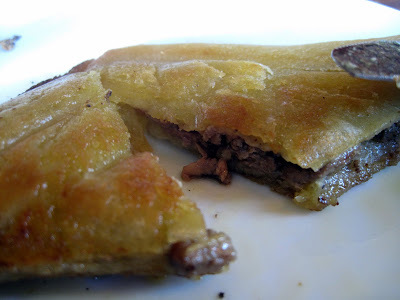 But, the main event, the fritters themselves contained more binding potato than they did of the key ingredient, which left them as well cooked but bland pieces of stodge rather than the meaty delight he had envisioned. Side dishes deserve particular praise. Bubble and squeak is so often rather unpleasant, but at Caravan, it is presented as a well-seasoned rissole, whose perfectly fried crisp casing broke to release a waft of savoury steam. The black pudding is some of the best either of us had tried anywhere and when questioned, they told us, it is made to order for them daily by Franconia in Putney. Studded with little nuggets of fat, the contents were softer than a traditional British black pudding, reminding us of the slightly sludgy but delicious Morcilla found in Leon, Spain. A comparison strengthened by a definite but not over powering smokey taste. Like other meals this week, service was still finding its way in the room, but could not have been more friendly and on the ball. They used the “zonal” method rather than the “man-to-man” method, so whichever server happened to pass our table dealt with us, meaning plates were delivered and cleared efficiently. 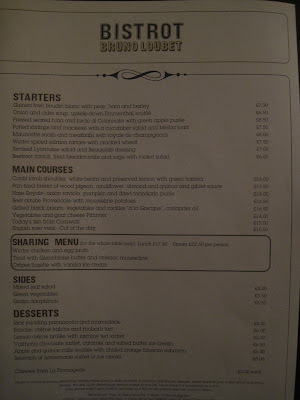 So good were the staff, in fact, that HP added another £5 to the charge already included in our £39 bill. £20 a head might seem like a lot for brunch, but after the eating slump DH have found themselves in for the last ten days, it seemed like reasonable value for good service, good ingredients and very good cooking. The sort of breakfast place that would make people from The Guardian weep that they had to move to King's Cross. Added to which, at no point did anyone use the excuse “please bear with us we have just opened” Other new restaurants would do well to take note. For those of you who don’t know, H Forman & Son produce some of the very best smoked salmon in the world and have been doing so for a century or more. They also run Forman & Field (http://www.formanandfield.com/) a mail order business which sells food from some of the very best producers in the United Kingdom. So, this meal, to be held in their stunning dining room, overlooking the new Olympic stadium, promises to bring us the very “Best of Britain”. Quite appropriate as It will also be held on the same day as the publication of my new book EATING FOR BRITAIN. There will be room for 50 people and, not only will we have the opportunity to eat some amazing food, but also to tour the impressive smoking facility of H.Forman & Sons and hear from some of their fantastic suppliers who will be providing ingredients for our meal. Everyone who attends will also, of course, leave with the now famous DINE WITH DOS HERMANOS goody bags, filled with all kinds of wonderful things. It promises to be a great occasion and I hope some of you will want to join us. Unfortunately, at the recent event at Indian Zing, we had a number of no-shows, particularly annoying as we had such a long waiting list. So, I am afraid from now on I will be taking deposits through a secure website (to be announced) All deposits will be returned if you cancel up to one week before the event. After that, they will be retained. So there. Please message me via Facebook or through the contact page on here if you would like to come. As before, I will draw names out of a hat, sometime in Mid March, and inform the lucky people soon after.